Hi everyone. It has been a sad weekend here after the terrible event that took place in Stockholm on Friday afternoon. We walk past that place basically every time we go to town and I am so sorry for the victims and their families. In a moment, everything can change. On a more positive note, we also had a visit from one of my oldest friends and her family, which was very nice. 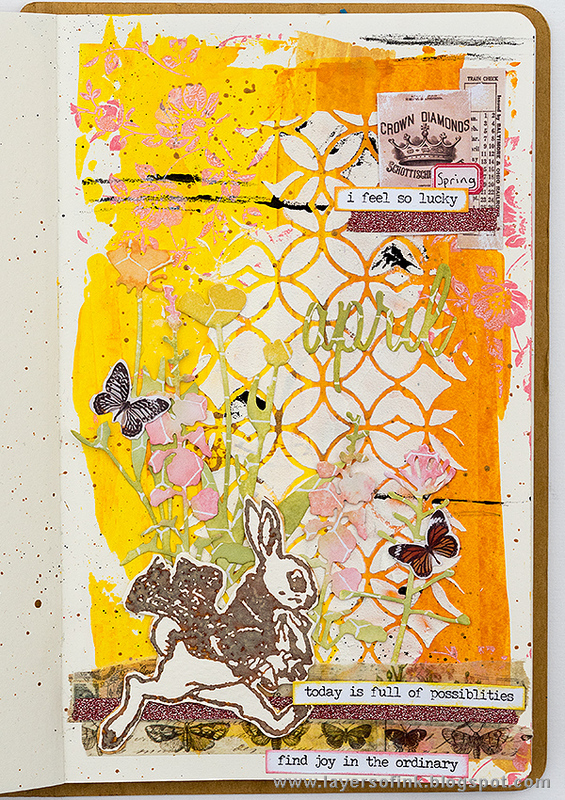 This week, at the Simon Says Stamp Monday Challenge Blog we have a Hip Hop challenge - it can, for example, be rabbit themed or something with music. 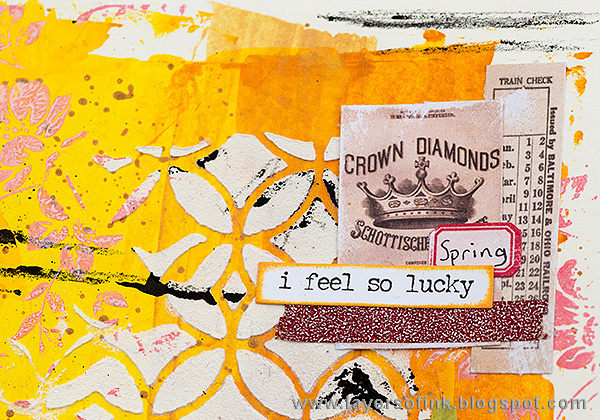 Our guest designer during April is Amy Bethke from Amy's Card Obsession. I hope you will stop by her blog to look at her very creative project. 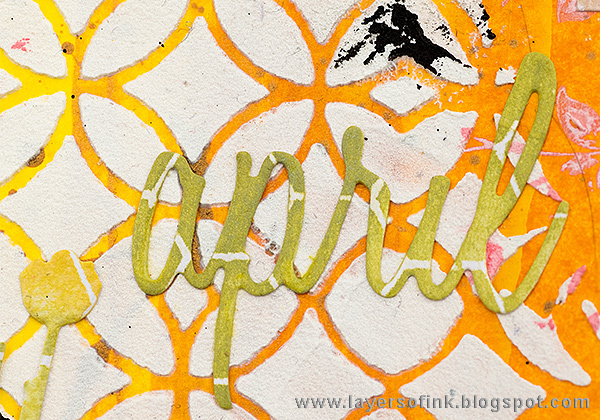 I made a spring-time art journaling page, using a page in my Small Creative Journal on which I had earlier smeared left-over paint and splattered left-over gold paint. Whenever, I have paint left, I tend to smear it in on of my art journals. I added some Embossing Paste through the Latticework stencil and the background was mostly done. 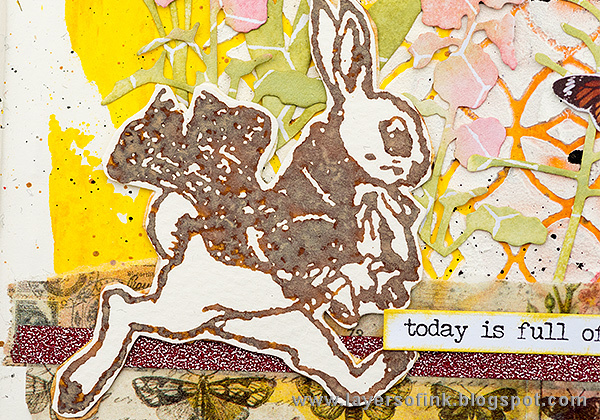 I like this rabbit stamp by Tim Holtz and stamped it with Vintage Photo Distress Oxide on watercolor paper, misting the stamp with water before stamping. You can see the chalky effect of the Oxides here. On the background, I added some black details and lines with a black Scribble Stick, and I also used a bunch of Snippets ephemera pieces, Small Talk stickers and Design Tape. 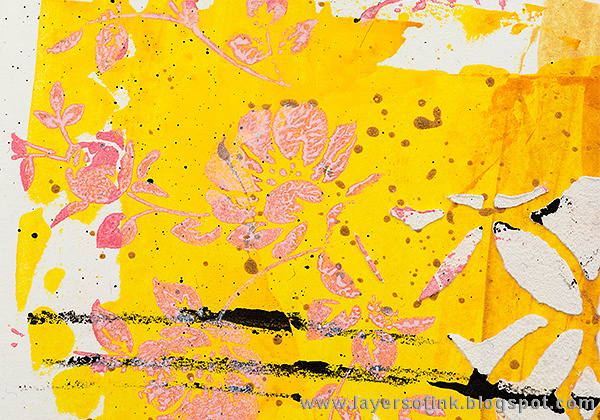 The flowers were stamped with Worn Lipstick Distress Oxide. 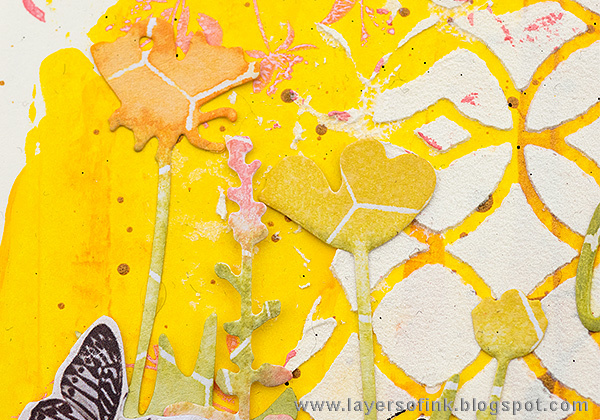 I die cut flowers from Motif Cardstock with the Wildflowers #2 set and inked them with Distress Oxides. After inking, I misted them with water. The paper has a honeycomb pattern, which resisted the ink. I like the soft pastel look of the flowers. The word was die cut from the same paper. 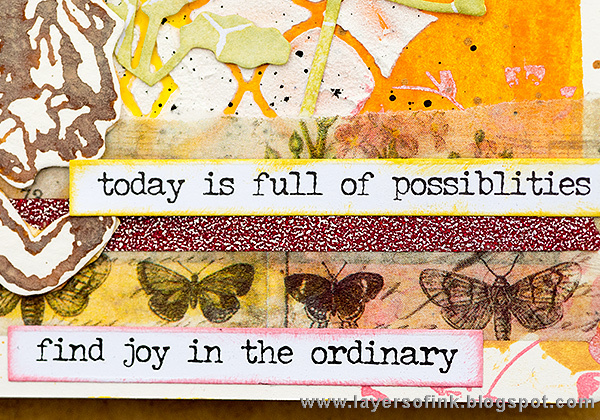 At the bottom of the page, I added some strips of Design Tape, and more journaling strips. I really hope you will join us in our Hip Hop challenge. As every week, you have a chance to win a $50 gift voucher from Simon Says Stamp. You have until Monday 8am Ohio time. 1pm UK time, 2 pm CET to join in. Thank you so much for stopping by here today!! I love your background, Anna-Karin. It's so bright and colorful and the bunny is so cute. He looks like he's in a hurry to get those Easter eggs delivered! Gaaf! Prachtige felle kleuren gebruikt. lente gevoel. Absolutely gorgeous! Love the background!! Too sad for words, but I find happiness in the joy you spread around the world through your blog. A big hug for all Swedes, and so many others in other countries. Thank you! In the wake of hearing about awful events any where in the world, I often feel a need for myself to make projects which are joyful and have a sense hope. Love this Anna-Karin. A great use for extra un-used paints to start another page with. 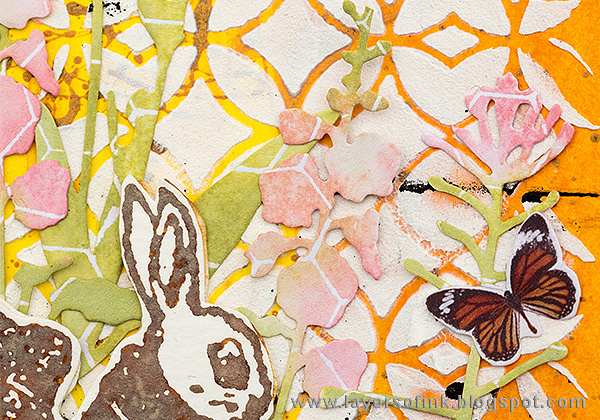 Also, I love how you used your stencil, such a pretty backdrop for the page! TFS! This is fantastic! I'm always impressed with how you use such unique color palettes. They're palettes I would never have thought of, but it is always the perfect choice!